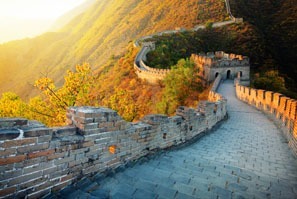 The Great Wall of China features strongly in the history of China. Discover the over-3,000-year history of China: a brief history with a China history timeline and introductions to the dynasties and periods. China is one of the world&apos;s four ancient civilizations, and the written history of China dates back to the Shang Dynasty (c. 1600–1046 BC), over 3,000 years ago. 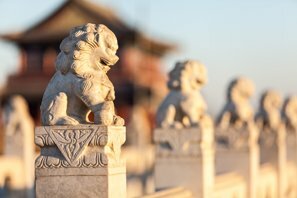 Here, we’ve outlined China’s history in a basic introduction and hope you have a good overview of it. Pre-1600 BC, China is charted mainly by legends and prehistoric evidence. The ancient China era was c. 1600–221 BC. The imperial era was 221 BC – 1912 AD, from China&apos;s unification under Qin rule until the end of the Qing Dynasty, the Republic of China era was from 1912 until 1949, and the modern China era from 1949 until the present day. Read on for a snapshot of China&apos;s historical timeline and some key events. 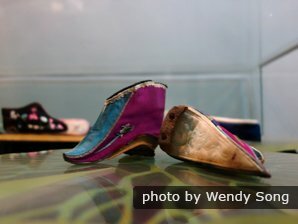 There’s also a simple comparison with the world’s cultural development. Prehistoric China&apos;s chronology is divided into the Paleolithic Age, the Neolithic Age, and the Bronze Age. Without any reliable historical records, most of what has been pieced together about prehistoric life in China comes from speculation about human activity at archaeological sites and unearthed relics. The rest comes from what might be truth within Chinese mythology. Possibly the first dynasty in ancient China, it&apos;s generally believed that the Xia Dynasty consisted of several clans living alongside the Yellow River. Most of the evidence for the Xia Dynasty, including its name, is perhaps just legend. There was a Bronze Age Yellow River civilization at this time at Erlitou in Henan; however, artifacts don&apos;t show conclusively that this was the Xia Dynasty of later writings. 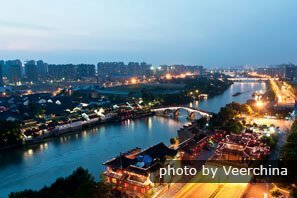 Chinese civilization began along the Yellow River in the Shang era, and spread from there when Bronze Age culture reached its peak. Then, traditional Chinese philosophies, such as Confucianism and Daoism, developed in the feudal Zhou era as China expanded in territory and population. Ancient China finally fractured into warring kingdoms for 200 years, and its reunification marked the start of the imperial China age. The Shang Dynasty was the first to have historical records remaining. Many bronze objects and jade articles, which date back to 1600 BC, have been found to support these early archaeological records. The earliest form of Chinese writing – oracle bones – was found. The inscriptions on animal bones had pictographic characters. The Shang Dynasty’s capital was Yin (Anyang) and its territory stretched between the lower reaches of the Yellow and Yangtze rivers. After the Shang era, the larger Zhou era territory was divided by a network of feudal states and was ruled over by kings. The king of Zhou only had direct control over a small portion of the realm and received tributes from the feudal states. 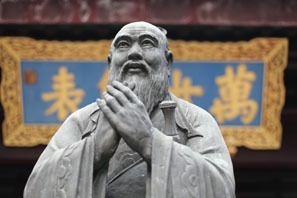 Confucius lived in the Spring and Autumn Period and had a strong influence on China&apos;s subsequent history. The first part of the Zhou era was called the Western Zhou (1045–771 BC). It was a fairly peaceful time but, after 770 BC, the Zhou king lost his authority and seven prominent states emerged. This era was divided into three periods: the Western Zhou Dynasty (1045–771 BC); the Spring and Autumn Period (770–476 BC), and the Warring States Period (475–221 BC). It marked the transition from tribal society to feudal society. Major philosophies and religions emerged that were the basis of Chinese beliefs in later eras, such as Confucianism and Daoism. From the first centralized feudal empire, the Qin Dynasty, which was established in 221 BC, until the collapse of the Qing Dynasty in 1912, this period is known as the imperial era of China. The imperial China period makes up the bulk of Chinese history. With the cyclical rise and fall of dynasties, Chinese civilization was cultivated and prospered in times of peace, then reformed after rebellions and conquests. The Qin and Han dynasties were the initial period of the Chinese empire. During this period, a number of institutions were established that laid the foundation of the basic political system for the next 2,000 years. The short-lived Qin Dynasty was the first to unite China as a country under an emperor instead of a ruling clan. A bureaucratic government was introduced, and was continued by the less extreme Han Dynasty. 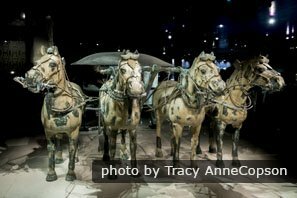 The Terracotta Army represent the army that changed China&apos;s history by uniting the country. The First Emperor — Qin Shi Huang was first to use the title of emperor in China. He and his Qin state united China by conquering the other warring states, and he ruled with an iron fist. Qin Shi Huang centralized the power of the empire after he took the throne and set up a system of laws. He standardized units of weight and measurements, as well as the writing system. The Qin Dynasty was the first and shortest imperial dynasty in China. It was famous for great building projects, such as the Great Wall and the Terracotta Army, which guarded the First Emperor’s burial objects and was to protect him in his afterlife. During the later period of the Qin Dynasty, Liu Bang, a peasant leader, overthrew the unpopular Qin regime and established the Han Dynasty. The longest imperial dynasty, the Han Dynasty, was known for starting the Silk Road trade and connecting China with Central Asia and Europe. 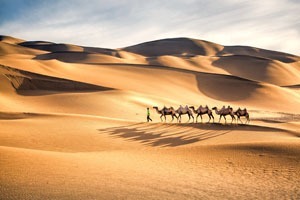 The Silk Road feautured strongly in China&apos;s history as a gateway for trade and cultural exchange. 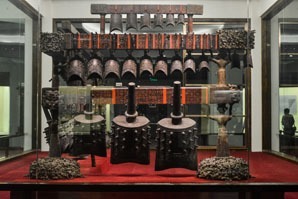 In the Han Dynasty, a bureaucratic system in which promotion was based on merit was established and Confucianism was adopted by the state for national governance. What’s more, agriculture, handicrafts, and commerce developed rapidly. During the reign of Emperor Wudi (r. 140–87 BC), the Han regime prospered most. The multiethnic country became more united during the Han regime. The Han Dynasty was one of the most powerful and important dynasties in China’s history. It had far-reaching impacts for every dynasty that followed it. When the Han Dynasty fell into decline, it fractured into the Three Kingdoms Period (220–265). After the Three Kingdoms Period came the Jin Dynasty, which then conquered most of China (265–420). Its hold on power was tenuous, however, and China again fractured, this time into the Southern and Northern Dynasties (420–589). During this messy time, many religions emerged and Buddhism was popular among the barbarian kingdoms in North China. After almost 400 years of chaos ended, the Sui Dynasty eventually unified China again in 581 AD. China&apos;s Middle Ages saw steady growth through a series of regime changes. The Grand Canal, representing China&apos;s huge civil engineering feats, is another feature of China&apos;s history. China went from having four warring kingdoms to being the most culturally sophisticated and technologically developed nation. Finally, it was consumed by the rise and fall of the phenomenal Mongol Empire, which stretched to Europe. In 581, Yang Jian usurped the throne in the north and, as Emperor Wen, united the rest of China under the Sui Dynasty. It was a short, intense dynasty, with great conquests and achievements, such as the Grand Canal and the rebuilding of the Great Wall. One of Emperor Wen’s most prominent achievements was to create the imperial examination system to select talented individuals for bureaucratic positions. Most of this dynasty’s government institutions were adopted by later dynasties. It&apos;s considered, along with the following Tang Dynasty, to be a great Chinese era. After the short-lived Sui Dynasty, the powerful and prosperous Tang Dynasty unified China once again. The Tang Dynasty continued with the Sui’s imperial examination system and optimized it. 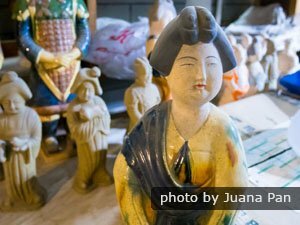 It ruled for three centuries, and it was also the golden age for poetry, painting, tricolored glazed pottery, and woodblock printing. In the middle of the Tang Dynasty, an immense rebellion appeared and some regions refused to follow the state’s authority. This situation continued to the end of the Tang Dynasty. After the Tang Dynasty came half a century of division in the Five Dynasties and Ten Kingdoms Period (907–960). This ended when one of the northern kingdoms defeated its neighbors and established the Song Dynasty. The Song Dynasty unified the Central Plain and Southern China. However, the territory under the Northern Song Dynasty’s (960–1127) control was smaller than the Tang Dynasty’s. The modern-day northern Hebei Province was occupied by the Khitan and was under the control of the Liao Dynasty (907–1125). In the northwest, the Western Xia Dynasty (1038–1227) – ruled by the Tanguts – controlled the modern-day Gansu and northwestern Shaanxi. Until the first half of the 12th century, the Jurchens (ancestors of modern-day Manchus) annihilated the Liao Dynasty and invaded the Northern Song’s capital. 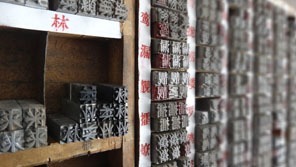 China&apos;s invention of printing influenced not only China history but world history. Then the Song government moved and reestablished the capital in Hangzhou, establishing the Southern Song Dynasty (1127–1279). The Jurchens established the Jin Dynasty at the Yellow River Basin until it was conquered by the Mongols in 1271. The Song era was a period of technological advances and prosperity. 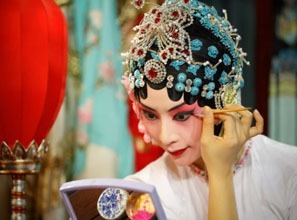 During the Song Dynasty, the handicraft industry as well as domestic and foreign trade boomed. Many merchants and travelers came from abroad. 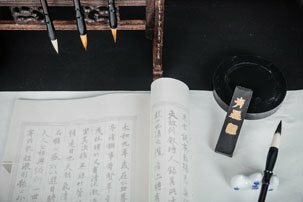 The "four great inventions" of the Chinese people in ancient times (paper, printing, the compass, and gunpowder) were further developed in the Song Dynasty. 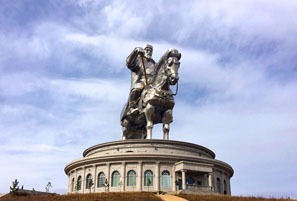 Genghis Khan changed China&apos;s history by bringing the nation under foreign (Mongol) rule. In 1206, Genghis Khan unified all the tribes in Mongolia, founded the Mongol khanate, and conquered an unprecedented swathe of Asia. At the end of the 12th century, Mongolian rule grew steadily. With Genghis Khan and his descendants expanding their territory, the Mongol Empire extended all the way to Eastern Europe. The part of the Mongolian khanate that ruled China was known as the Yuan Dynasty (1279–1368). From 1271 to 1279, his grandson, Kublai Khan, finally conquered the Song Dynasty and founded the Yuan Dynasty. He made Dadu (modern-day Beijing) the capital of the first foreign-led dynasty in China. Trade, technological development, and China’s introduction to foreign countries continued under Mongol rule. Marco Polo from Venice traveled extensively in China, and later described China&apos;s culture and marvels in his book, Travels. In the Ming and Qing dynasties, the imperial social structure (the royal/rich class, the scholarly class, the working class, and the slaves) and imperial examinations continued. However, they became increasingly inadequate in the ages of exploration, colonization, and industrialization. 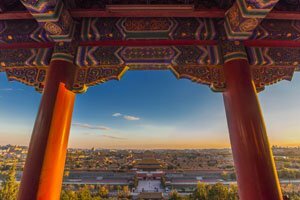 The Forbidden City represents the climax of imperial China history. After a series of natural disasters and rebellion movements led by the Han people, a new native dynasty was established in 1368. The founder, Zhu Yuanzhang, replaced the waning Mongol Empire in China with the Ming Dynasty. It was the last ethnic Chinese dynasty, sandwiched between two foreign ones. The Ming Dynasty represented a long period of stability. When his son and successor, Zhu Di, ascended the throne, he started to build the Forbidden City in Beijing. In 1421, he officially made Beijing his capital. He was very supportive of international trade and sponsored several voyages to the West. It was an era of native Chinese strength and prosperity, which faltered due to natural disasters and greedy leadership, as had so many dynasties before it. Eventually, the Ming Dynasty fell due to the frequent peasant rebellions and Manchu attacks. The Summer Palace&apos;s destruction by European forces represented a key moment in China&apos;s history. It could not be restored to its former glory as imperial China&apos;s strength waned. In the late Ming Dynasty, the Manchus in Northeast China grew in strength. The Manchus attacked China for three generations in succession, and finally founded the Qing Dynasty. It was the last imperial dynasty in China’s history. The two most famous emperors of the Qing Dynasty were Emperor Kangxi (r. 1661–1772) and Emperor Qianlong (r. 1735–96). Their reigns were "a golden age of prosperity". However, the last Chinese dynasty is shamefully remembered for the forced trade of the late Qing era. China was reduced to being a semi-colonial, semi-imperial country after the First Opium War, which began in 1839. Modern China&apos;s territory was established during this era. 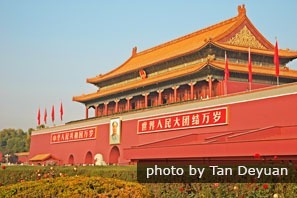 Tian&apos;anmen Square has witnessed many key events in China&apos;s history, in particular the founding of the People&apos;s Republic by Mao Zedong on October 1, 1949. The Republican Revolution of 1911, led by Sun Yat-sen, ended the rule of the Qing Dynasty. However, the Republic of China could not be firmly established across China, with civil war ensuing for decades. Since the founding of the People&apos;s Republic of China in 1949, China has entered a Communist era of stability, with the Reform and Opening Up policy of 1978 bringing in China&apos;s phenomenal economic growth.